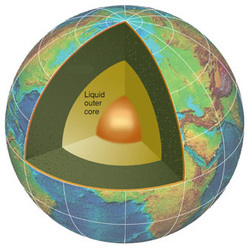 The outer core is the outer most layer of the core because it is a liquid aposed to the inner core, which is a solid. This is a layer which also is composed of molasses like iron and nickel. The temperature of the outer core can range from 4400°C to 6100°C. And the thickness of the outer core can be up to 1250 k. deep.